It's always better to go on an African safari with a guide, right? This is a common misconception that many people have. The fact is that a self guided (also known as a self drive, self catering or road trip) safari has a number of advantages over an operator guided tour. It's an option that you can seriously consider for your own safari adventure. » Wildlife Spotting - You can see just as much wildlife when guiding your own safari as when tagging along with a safari operator (I share ten essential tips in the guide which makes this possible). » Flexibility and Independence - It's a lot more flexible. You decide how long you want to spend at a sighting whereas the safari guide has to move on quickly to try and keep all his guests happy. » Better Wildlife Photography - This flexibility is a huge advantage of an independant safari, especially for wildlife photography because you need patience to get a great picture. You're the driver, you're in charge, so you call the shots. » Costs Less - It's much more cost effective and a lot easier on the budget. You can get the same standard of accommodation and food as the safari operator will offer you and still pay a lot less. Guided safaris can often cost twice as much (the guidebook details how to work out exactly what your self drive will cost). » Family Safari Friendly - You can enjoy a dream safari with your whole family. Many guided africa family holidays have a limit whereby children under 12 aren't allowed to go on game drives because they might be unruly and spoil the experience for the other paying customers. » Accommodation Choices - You choose where you want to stay and the options run from budget right through to ultra luxurious (the guideboook contains all the accommodation options, costs and how to book them). With the safari operator you are stuck with the accommodation they decide on. » Best of Both Worlds - When you are on a self drive safari, you get the best of both worlds because you still have the choice of going out with a guide as virtually all the national parks and game reserves in Southern Africa offer morning, day and/or night drives with a qualified guide (all the activity option in each reserve, costs and booking procedures are covered in the book). So when it suits you, you can book a game drive with the guide and then by all means pepper him or her with questions (the guides enjoy sharing their encyclopedic wildlife knowledge) for the three hours or so duration of the trip and then you can go back to the independence and flexibility of driving yourself through the reserve. Some of the major drawbacks of a self drive safari is that you need to do all the planning and handle the logistics yourself and that you don't have any local knowledge if you haven't been on a safari to that area before. To help you overcome this, I've written the 248 page Guide Your Own Safari ebook which contains much of my 25 plus years of local safari knowledge and leads you successfully through every step of the process of planning and carrying out your African safari. My name is Bruce Whittaker and I have over a quarter of a centuries experience of self guided safaris in numerous national parks and game reserves in Southern Africa having been on hundreds of self drive safaris over the years myself. In the process I have travelled the equivalent distance from Cape Town in South Africa to Cairo in Egypt at least four times over. I have condensed all this local knowledge and experience into the Guide Your Own Safari book to make it child's play for you to plan and carry out your own African self drive safari. In 2007 alone, my wife Wilma and I travelled over 15 000 km (9320 miles) visiting all the top national parks and game reserves in Southern Africa and the final results of our experience and research is contained in this travel guide book. You won't find the conclusions we present anywhere else because there is no other safari guidebooks like this available at the moment. We have been to all the wildlife areas covered in the book using our normal sedan vehicle (no 4x4 needed), many of them on numerous occasions through the years. We self drive the Kruger National Park at least once a month, every year. So you can use this guidebook with confidence to undertake your own self drive safari because everything has been tried and tested by us again and again. It's like being on a guided safari except that you have all the advantages of a self guided safari thrown in too. I have included in the book the top safari destinations in Southern Africa where it's possible to guide your own safari with a normal 2 wheel drive sedan vehicle (you can use a 4x4 there too if you want). Locations that you can only get to with a 4x4 vehicle or where self driving is not possible incur a higher cost so I left them out of the book completely. There are detailed satellite maps of each region to help you with navigation. You can zoom in so far you can actually see the accommodation buildings of the main rest camps where you will stay on your safari. Distance and time calculators give you accurate logistical information to help you plan your routes effectively. Take a look at the full Guide Your Own Safari index for a comprehensive overview of the information and advice the ebook contains (it's too long to list everything here). 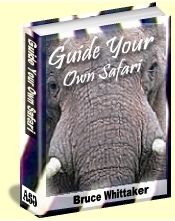 The Guide Your Own Safari book has the potential to save you money while maintaining the overall value of your African safari. A guided safari can cost double the price of a self drive safari, and yet you will have the potential to see the same amount and type of wildlife because, after all, the self drive and guided safaris both take place in the same area. And the standard of accommodation and food that you can expect is similar for both forms of safari so you don't have to compromise on that either. By following the exercise to estimate the cost of guiding your own safari outlined in the book and then getting a quote from any safari company for the equivalent guided safari, you will be shocked by how much the self drive safari will save you. Do the calculation, it will amaze you. So by spending only US$19.95 on the Guide Your Own Safari ebook you will be saving a substantial amount of money for a safari experience that is just as good and in some cases even better than the more expensive guided safari. Straight after payment you will be directed to a download page and you will also receive an e-mail (triple check that your e-mail address is correct) with a link to retrieve your eBook, and in just minutes you'll have access to all the Guide Your Own Safari knowledge. The eBook is created in Adobe Acrobat electronic file format (PDF file). If you don't have the Adobe software to read PDFs, you can download and install it here for free. PS...Once you own the guidebook you are entitled to all future editions free as I regularly research and add top new safari areas and update the existing ones to keep them current. Money Back Guarantee - If for any reason the Guide Your Own Safari ebook doesn't live up to your expectations I will refund your money within eight weeks of your date of purchase. Simply e-mail me the reason why it fell short in your estimation (which helps me improve the guide) and I will issue a 100% refund to you. 2Checkout.com, Inc. is an authorized retailer of Guide Your Own Safari.